Areas near Rosemont not included due to absence of breeding. The federal government will designate more than 10,000 acres in Arizona and New Mexico as prime habitat for the threatened Chiricahua leopard frog. More than a dozen streams and many livestock watering tanks across Southern and Central Arizona were picked by the U.S. Fish and Wildlife Service as critical habitat for the frog, a threatened species. The Las Cienegas National Conservation Area, Florida Canyon in the Santa Rita Mountains, Peña Blanca Lake near Nogales, Sycamore Canyon in the Atascosa Mountains and Ramsey and Brown canyons in the Huachuca Mountains are among the critical habitat sites. But other areas near the proposed Rosemont Mine site in the Santa Ritas that have had leopard frogs were left out because the frogs aren't known to breed there now - largely because there's less water there than there was several decades ago. The decision means one less legal issue for the mine, since lands designated critical habitat can't be destroyed or seriously modified by projects that need U.S. permits. Last year, mine opponents with the Center for Biological Diversity and Pima County recommended six livestock watering tank sites on Forest Service and private land in the mine area as prime frog habitat. The Wildlife Service rejected them in its decision this week and chose six other tanks farther away, within two or three miles of the mine site. In recent years, such tanks have become key areas for the leopard frog. COURTESY OF DENNIS CALDWELL This Chiricahua leopard frog was photographed on the east slope of the Santa Rita Mountains, within the newly designated leopard frog habitat. Mary Richardson, a wildlife service supervisory biologist, said the agency determined the Rosemont sites didn't meet critical habitat criteria. First, there is no indication that frogs breed there. Leopard frogs can travel as far as five miles, spending time in one area and breeding in another. Frog researchers Philip Rosen, of the University of Arizona, and Dennis Caldwell, a private researcher, said the Rosemont-area sites are worth protecting, and that breeding could be restored there. But they agreed that the areas don't meet the feds' critical-habitat standards without breeding populations. Michael Robinson of the Center for Biological Diversity said that overall, the group is pleased by the habitat decision. But it was disappointed that the Rosemont-area tanks weren't picked. Robinson said the mine could obliterate frogs on its land and could destroy their ability to survive nearby due to dust, toxic chemicals, blasting sounds and truck traffic. 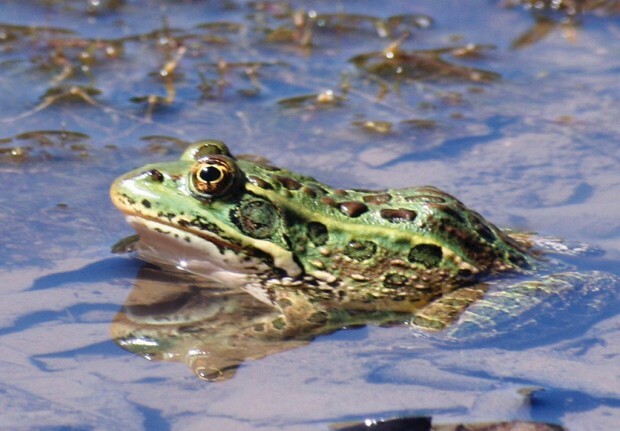 Julia Fonseca, Pima County's environmental planning manager, wrote the Wildlife Service in 2011 that leopard frogs were reported as "abundant" in the Rosemont area in the 1970s by private biologists. While the surveyors didn't note whether they were Chiricahua or lowland leopard frogs, the Arizona Game and Fish Department concluded in the 1990s they were Chiricahua frogs. Surveys by Rosemont Copper consulting firm Westland Resources found those frogs in the six Rosemont-area water tank sites in a 2008 survey, but they weren't breeding. Still, the frogs' presence throughout the Santa Ritas suggests the area contains a regional group of connected populations whose habitat needs protection, said Fonseca and Robinson. Rosemont Copper official Kathy Arnold said based on the company's surveys for frogs and other species, the Wildlife Service findings met Rosemont's expectations. "Rosemont works with Arizona Game and Fish, U.S. Fish and Wildlife Service, the University of Arizona and the U.S. Forest Service, as do other ranches and property owners in the area," Arnold, Rosemont's vice president for environmental and regulatory affairs, added in a written statement. "Contributions besides the survey work include providing water to habitat during dry periods, assisting with stormwater controls to control sediments entering ponds, and managing and providing access to habitat," she said.